Geostatistics is a common tool in reservoir characterization. Written from the basics of statistics, this book covers only those topics that are needed for the two goals of the text: to exhibit the diagnostic potential of statistics and to introduce the important features of statistical modelling. This revised edition contains expanded discussions of some materials, in particular conditional probabilities, Bayes Theorem, correlation, and Kriging. The coverage of estimation, variability, and modelling applications have been updated. Seventy examples illustrate concepts and show the role of geology for providing important information for data analysis and model building. Four reservoir case studies conclude the presentation, illustrating the application and importance of the earlier material. This book aims to help petroleum professionals develop more accurate models, leading to lower sampling costs. 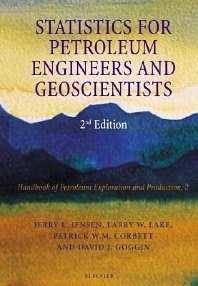 It is an ideal book for petroleum engineers, geoscientists, hydrologists, and faculty and students in these and related fields. A very good book with the basic of statistics applied to Petroleum Industry. Unfortunatly, it is not in EPUB format.